Planning a romantic weekend exploring San Francisco and looking for one of the area’s best seafood restaurants? Alioto’s is a local secret, offering private dining and banquet rooms to all patrons looking for the freshest seafood and most enticing recipes. 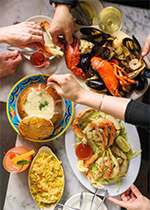 With the facilities to accommodate a quiet romantic dinner for couples, as well as larger family gatherings, Alioto’s Restaurant in San Francisco is the place for high-end seafood. Enjoy a fine seafood meal right on the water at Fisherman's Wharf. A private dining experience as you look out onto the beautiful harbor is sure to set the mood for any special occasion, whether you're enjoying a meal with that special someone or hosting a party in one of our banquet rooms. Our seafood restaurant serves the freshest dishes in San Francisco and is sure to offer something to suit every taste. 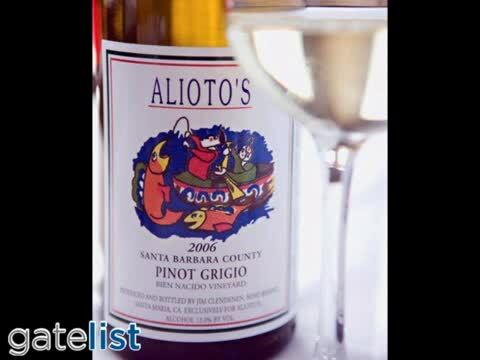 A seafood restaurant with a twist, Alioto's has been serving the San Francisco area for years. We serve only the most delicious seafood dishes, prepared fresh to order with quality ingredients. It is truly one of the best private dining experiences in the area. Alioto’s long history begins as a small fresh fish stall on Fisherman’s Wharf in 1925. Since that time, little has changed in terms of the fresh seafood that Alioto’s Restaurant uses. Alioto’s Restaurant still buys the freshest seafood directly from the wharf, including sea bass, sole, swordfish, scallops, and the iconic Dungeness crab. A seafood restaurant with integrity and respect for its roots, Alioto’s Restaurant never compromises on quality and source of our local seafood. Intimate private dining or banquet rooms available! Alioto's Restaurant has worked hard to create a unique private dining experience for our guests. If you are planning a celebration dinner or a romantic meal, a private dining experience is exactly what you need. Make your reservation for our seafood restaurant today. Guests love Alioto's Restaurant for our food but also for the private dining atmosphere that we create for our guests. If you're looking to have a romantic evening or perhaps a special celebration, Alioto's of San Francisco is a wonderful choice. Seafood is popular in San Francisco. There are fine dining restaurants all over the area that serve all types of seafood dishes. What makes us different at Alioto's is that we are determined to utilize only the freshest and finest seafood in all of our dishes. We create signature entrees that are made to order, exactly to the customer's specifications. Our seafood restaurant is unlike anything else you've ever experienced. Delicious food cooked to order is accompanied by an intimate and private dining experience. When you're craving fresh, made to order seafood, Alioto's of San Francisco is the place to be. Stop in and taste the difference. San Francisco is a well-known area for fancy dining restaurants, seafood restaurants and more. For special occasions or a simple night out, Alioto's Seafood Restaurant will surely impress you. The talented chefs at Alioto’s Restaurant are skilled in cooking fresh seafood the way you want it, featuring charcoal grille or griddle-fried methods. However, Alioto’s Restaurant also offers time-honored Italian specialties passed down for generations, including the famous Cioppino. Alito’s Chippino is a tomato shellfish stew that was perfected by Rose Alioto, the founder of the restaurant. Featuring our specialty Cioppino, as well as a Sicilian mixed grill, seafood cannelloni, risotto, and a beautiful artichoke and arugula salad, Alioto’s Restaurant is the perfect place for romantic private dining at a beautiful seafood restaurant. Alioto's Restaurant is a one of a kind seafood restaurant in San Francisco. We can prepare delicious menu options for any occasion. Contact us today for your next night out! Alioto’s Restaurant also offers amazing banquet rooms for a private dining experience that can support the whole family. Perfect for corporate events, wedding receptions, or large scale gatherings, the Waterside Café and Old Wharf Room of Alioto’s Restaurant can comfortably hold a combined 104 people. With breathtaking views of the Golden Gate Bridge, more beautiful banquet rooms than Alioto’s Restaurant are impossible to come by. 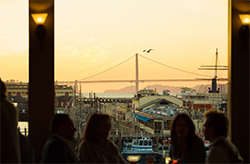 Host your private dinner or family event at the best seafood restaurant in San Francisco. If you are planning a private party or get together, why not host it at one of the banquet rooms at Alioto's Restaurant? We have ample space for any size function. We are also a great choice for office functions to be held in our banquet rooms. Alioto's is perfect for large parties and small get-togethers. Reserve our banquet hall for any function. Relax and let us do the rest. We can host your next event. To book a room for your next event, please contact us today. For a unique and private dining experience, Alioto's Restaurant should be your first choice. Our seafood restaurant is located right on the picturesque San Francisco Bay, offering you and your guests stunning views of several of San Francisco's most famous landmarks. Host your next event in one of our banquet rooms, and you'll see what makes us one of the most renowned seafood restaurants in the city. Unlike most restaurants in San Francisco, Alioto's Restaurant offers FREE PARKING for all our valued guests. We offer 2 hour validated parking up until 6 P.M. along with 3 hours validated from 6 P.M. until midnight. Embark on a memorable dining experience at one of San Francisco’s finest seafood restaurants. Call Alioto’s Restaurant today to place an order or make a reservation! Alioto’s Restaurant is a renowned Seafood Restaurant conveniently located in Fisherman’s Wharf. We specialize in Private Dining in our Banquet Rooms for a variety of events. Aliotos’ only purchases the freshest seafood available, ensuring each dish exhibits quality. Visit www.aliotos.com for further information.